Reading back through some of my reviews of pistols during my tenure at TTAG, I’ve realized that the only features I really care about (besides reliability) in a carry piece are grip size, trigger, and sights. The first is usually set in stone (or polymer), the second is sometimes a costly fix, but the third is where the money is. Unfortunately, pistol sights are susceptible to the theory of Long Tail. There are soooo many ideas out there, and the barriers to entry are so low, that cool ideas can get lost in the noise. Fortunately, TTAG cuts through the noise and puts new products to the test. With that out of the way, let’s get to reviewing. 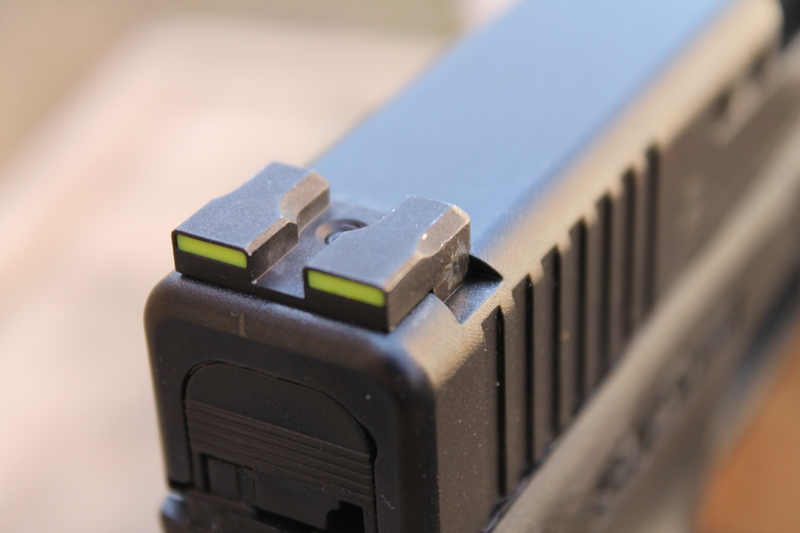 In this case, Aimline’s pistol sights. Do they work? Absolutely. Make the jump to learn more. Pistols I’ve shot in the last few years basically use three sighting systems. First is the three-dot system, then there’s the blade & dovetail, and finally web have the GLOCK ‘U’ system. I favor the three-dot system for speed, the blade & dovetail for precision, and the U system for occupying space in the trash can. My experience has been that the dot system is good enough for a quick shot, but unless there’s a crisp horizontal line that can be leveled across the top, a precise shot can be hard to take. Conversely, a blade & dovetail setup, assuming enough light shows between the sights, can be very accurate, but in low-light or quickly developing situation, they aren’t as easy to use. That’s not to say impossible, just not ideal. Aimline figures that lining up horizontal lines in the same plane is easier for the brain, and making those lines stand out vibrantly can only help. My experience bears that theory out. My process for pistol presentation is to sight my target, bring my up pistol two-handed from my chest, and wait for the front sight to materialize in my peripheral vision as I push the pistol out towards the target. 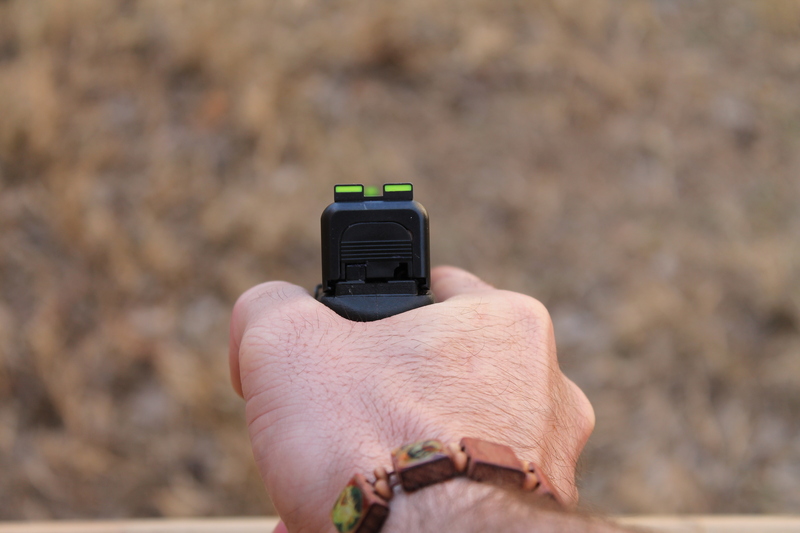 The neon green on the Aimline is impossible to miss so once the front sight is on target, the rear lines up very easily. Again, your brain loves to have things in alignment, so those three bright, green bars naturally come into alignment. These sights are very quick to acquire in sunlight, indoors, and in low light conditions. Aimline promises on their FaceBook page that Tritium sights are in the development pipeline. Eagerly, we shall await them. As you can see above, there’s also a crisp horizontal line formed by the non painted portion of the sights that is useful when a precision shot is necessary. Simply rough it in with the painted lines, and then utilize the top line as a reference to make a very precise shot. One unexpected benefit of the Aimline system is how easy it is for newbies to pick up. As proof of this, I took a bag of pistols on a visit to see my in laws shortly after getting the Aimlines installed. After trying out red dots, three dots, blade/dovetail, and the Aimline system, my sister in law declared the Aimlines her favorite. To my knowledge, she can count the number of times she’s held a pistol on one hand. She felt that the Aimlines were very easy to pick up and made lining up on target simple. For those who like the ability to rack the slide on a belt, counter, or boot, Aimline has you covered. The rear sight has a flat, perpendicular face perfect for catching on any surface you have available for those one handed manipulators. Operator status achieved! Before I discuss accuracy, I’d like to address installation. If you have a gunsmith you like, advise him to have a MGW Sight Pusher before he installs the rear sight. If you’re planning on doing it, you should do the same. I say this as a guy who busted up a Glockmeister tool doing these. Aimline’s Jason Starne acknowledges that these sights are uber tight and actually made the recommendation of the MGW tool. I didn’t listen and ended up breaking a borrowed tool. What finally worked was running the rear sight on a honing stone for a few minutes. Once I did that, and lubed up the Glockmeister took, the rear sight finally got into place. Now to the most important part, accuracy. Well first, precision. These sights are very precise. 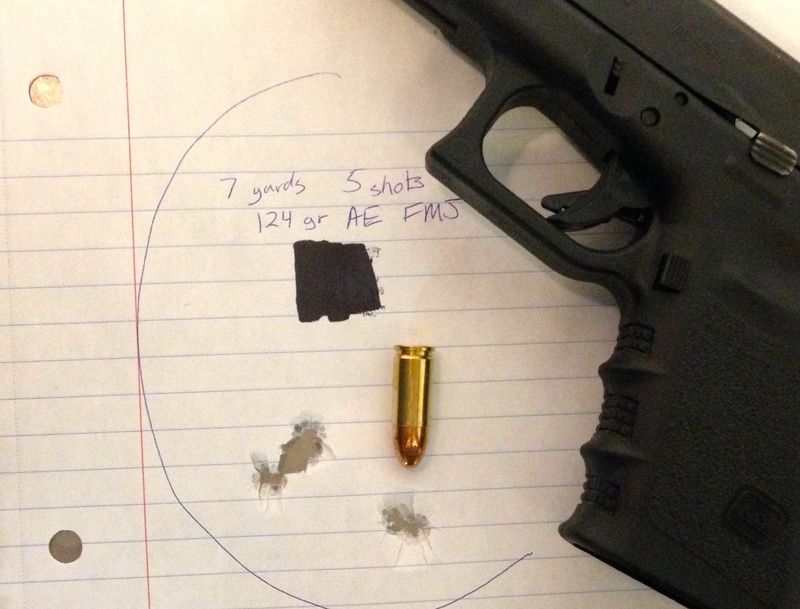 As evidenced by the slow fire targets below, the Aimline sight system holds up. Unfortunately, precision isn’t accuracy. And while these sights have helped me shrink my groups, they now sit some distance below my point of aim using a “front sight under target” sight picture, and accuracy that is not. Much like the compensation I had to adopt to shoot the FNS 9 to point of aim, the Aimlines need a bit of user tweaking to hit where they aim. Specifically, cover the target with the sight versus placing the target on top of the front sight. With the squared-off rear dovetail and generally snag-free design, the Aimlines are a very nice combat sight. They allow the user to rack the slide on a belt, boot, or countertop but won’t snag shirts or pants. And they function very well. I was able to precisely place my shots, albeit a few inches low. All that’s worth it though, as I’m now able to shoot with my GLOCK like I shoot with my XD(m). Which is a very good thing. If you pay someone to install these, this is a five star rating But if you do the install yourself, you’ll need a very solid sight pusher and a little bit of elbow grease. 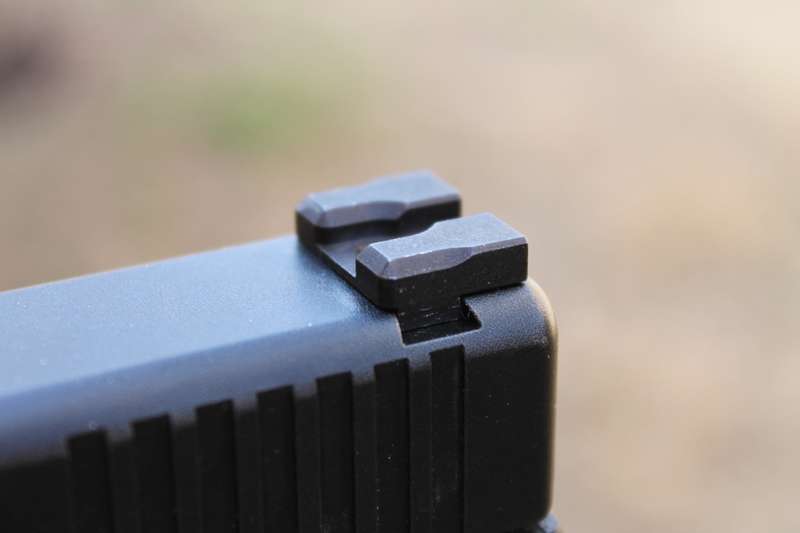 Once installed, torque down the set screw on the rear, and you’re guaranteed to never have your rear sight to depart. Once installed, these sights are rock solid. They show a well thought-out design. They’re just enough, without being too much. They’re intuitive and accurate. However, they’ll only get four stars until POI equals to POA. Question of the Day: Do You Bring Your Gun When You Shop for Clothes? @Tyler, point of aim, point of impact (POA/POI) has long been the standard for modern semi-autos….the 6 o’clock hold was more of a bullseye/revolver shooting method. Your FNS is spot on the way it should be if I understand correctly, your description. To prove accuracy in these sights, I’d much rather see some 25 yard shootiing versus 3 and 7/15. Do they offer different sight heights? I found this image on Pistol Training. I use Sight Picture #2. Are you saying that Sight Picture #3 is the preferred hold I should be using? #2 is what you should be using. Are you bringing your head up to see where the bullet strikes the target? @TK, negative. You got it right with Sight Pic #2. That is POA/POI. That SHOULD be where your FNS should be shooting. So, are you saying with SP#2, your FNS is shooting low? 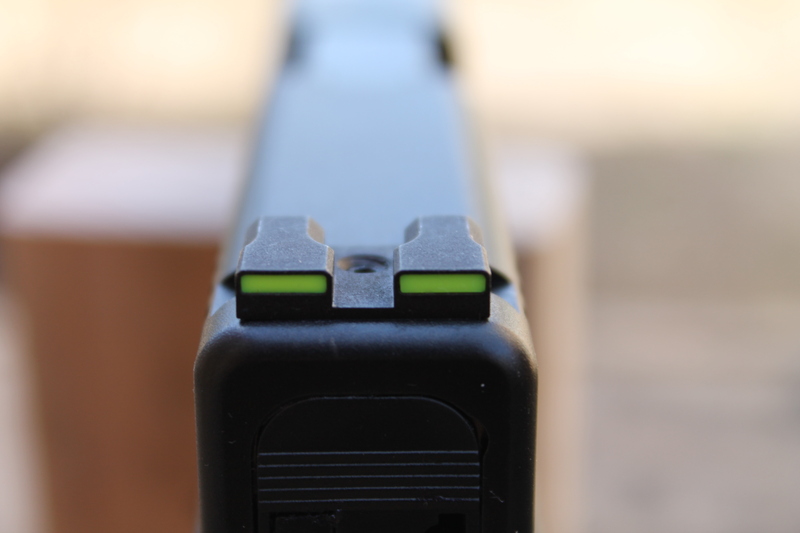 With Sight Picture #2, the Aimline Sights tested here mounted on a Glock 19 shoot low. And on the FNS-9 I tested, I used SP #2, and my POI was also low. @TK, as Jeremy S said, most times they offer different front sight heights to correct for that low grouping. Or at least, they should. One should not have to arc a round into the bullseye. El Mac, I think the implication that a new front sight can be had to correct for the gun shooting low is a misrepresentation of what’s happening. Again, that gun was designed for a bullet impact in the middle of the front sight dot. It is not wrong or bad or “off” or whatever. It’s not shooting low; you’re lining the sights up incorrectly. If your preference is for a different sort of sight alignment then, sure, you could swap out one of the sights for a shorter/taller one (or file one of the sights down in the event that the alignment happens across the tops of the sights rather than with dots/marks on the sights). I would still suggest doing a little training and practice with the “combat” sight picture, as I firmly believe it to be faster and better for self defense use. Put front sight on target, pull trigger. For me, this is faster and easier than ‘align top edge of front sight with target.’ As you are supposed to be focusing on the front sight, it’s significantly easier to focus on the middle of the sight (on the dot if it has a dot, or on the fiber optic dot or just the center if it’s solid… no matter what, you’re focusing at the middle) than trying to focus on the top edge of the sight. If I’m looking at the dead center of the front sight, it’s easier for me to “see” the target that’s directly behind the dead center of it vs. the target that’s over it. Again, personal preference on that but it isn’t fair to suggest that the gun’s sights are “off” when it’s shooting as designed. @JS, it is personal preference. But #3 falters badly when you need precision and you are held accoutable for each shot. Up close and personal, it won’t matter either way. Put some distance between the combatants, throw a barrier up between them and/or possibly a hostage and #3 becomes extremely unforgiving. It’s all relative. For bullseye target shooting, #1 is the best. The same arguments you just made against sight picture #3 could be made against #2 if you prefer #1. #2 still blocks the lower half of your intended target (increasingly bad at longer ranges) and, when your target is a round circle on paper, it’s harder to center it. Lining the top of the front sight up with the very bottom-most point of the circle is the most precise and therefore why #1 is found on target pistols. In real life situations, like the hostage situations you’re finding yourself in, none of it really matters and precision isn’t measured in whether you can hit a specific nostril but whether you can hit a specific area. Take it to the highest level of precision that could be expected and you’re talking a T Zone hit. #3 is more than accurate enough to do that reliably and, I believe, is likely the more instinctive thing that people do when under high stress. It works for me wonderfully with my CZ SP-01 in IPSC, which includes shooting as quickly as possible and lots and lots of hostage targets out to 25 yards (where I typically shoot these events). Plenty of those require head zone hits. No problem. Again, not an eyeball hit or a 2nd-button-on-the-polo-shirt hit, but an A head zone or chest A zone hit. If you don’t have at least that much of a BG visible there’s no freakin’ way anyone’s taking a shot with a pistol w/ a “hostage” in front regardless of sight picture. At any rate, that’s all my opinion and personal experience, but I’ll also defer to Sig, S&W, CZ, etc etc etc for what they have chosen as the ideal sight picture for combat/duty guns. That is to say picture #3 in most cases, as you can see very clearly explained in Sig’s FAQ that I quoted below. I have no clue what sort of research and data feedback they have gathered over many decades to decide on that sight picture for their duty guns, but considering these are some of the very most popular LE and military firearms in the world I think you’ll be hard pressed to convince me (or Sig, etc) that sight picture #3 “falters badly” in the use case you outlined, which is the precise use intended for by these and other manufacturers. @Jeremy S, I’m not trying to change your opinion. I have more than enough real world experience with human targets and paper targets to have developed my own opinion. Also, as I stated earlier, in the agency that employs me, it is #2, POA/POI be it with a SIG, GLOCK, BHP, SW, or SA. It is that way with the long guns as well. I might postulate that the reason it works for you is that you are shooting at paper – not people, not their watching hands, looking for weapons, listening to a potential hostile and reading his eyes/face, etc. Just a postulation. Hey, if you dig it and it works for you, keep at it. Image #3 is plenty common for “combat” pistols. #2 is more common in general and is a more typical target and cross-purpose sight picture, but #3 is the design intention of many combat/defensive guns for sure. @Jeremy S, that is incorrect. I know of no modern pistol manufacturer that intentionally sets up their pistols to operate that way. If you know different, please provide further information. The fact is that MANY (if not most) “combat” handgun models, from Sig to M&P to CZ to Beretta to Springfield to H&K to many many others ARE designed so your bullet impact is precisely in the center of your front sight dot. Range from target and bullet choice (weight, velocity, etc) can change this. 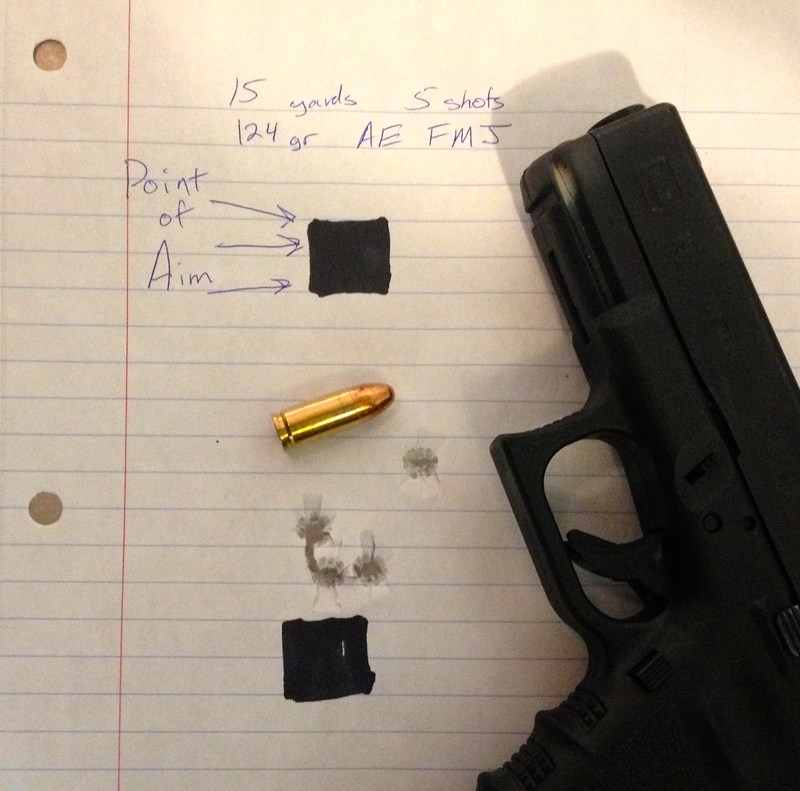 But at self defense ranges with typical self defense ammo, this IS how they are designed to shoot. If you don’t like it you can often get front sights in different heights. I personally do like it. It makes sense to me for a combat sight. It is not as precise for target shooting. IMHO these Aimline sights are intended to be combat sights and I would expect the POI to be centered in the front sight both left-to-right and top-to-bottom. Jeremy S. is 100% correct. Picture #3 is what you should be using. Actually, it looks like I was totally wrong about my assumptions RE Aimline. They very clearly state that their sights are designed for sight picture #2. This changes my opinion on Tyler’s G19 POI in this case, as it should be spot on w/ picture #2. I still think the FNS is likely working as designed, as per all of the crap I’ve already bombed this comment thread with. That looks like a workable set of sights for those of us with,ahem, older eyes. And for those with *ahem* pretty bad eyes. Funny how we are all different. I actually like the glock pattern “U” and dot sight more than any other non-illuminated/fiberoptic sight for fast work. I’ve noticed that, now that I am very proficient with the Steyr trap sights, I pick them up incredibly fast and can accurately engage targets rapidly. It seems like they are complicated at first, but once you realise that all you need to do is make a triangle and that your brain naturally creates it anyways, it becomes real easy to draw and get on target fast. I’ve improved my first shot speed a bit over my CZ while using these in USPSA production.. However, my CZ’s trigger work and the lack of the Steyr trigger work in general obviously gets the CZ ahead after the first shot taken on a course. Hunh, pretty cool! Had never seen those before; looks easy & logical to me. It would be nice if they had those available for other pistols. They are complicated to learn and understand, but once you manage to sort this graph out it and just sort of let it happen, your brain actually ends up doing alot more of the work naturally than if you were to think about it too hard. 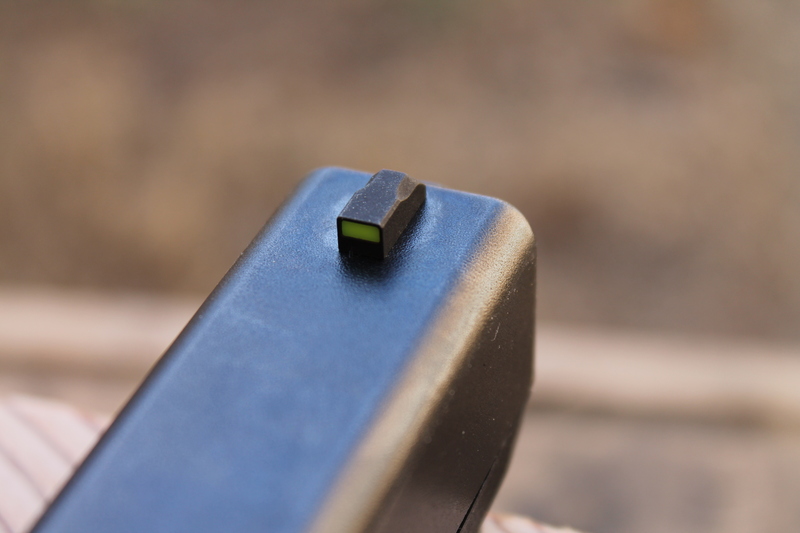 Lot’s of things are tried to make pistol sights easier to use easier to pick up quickly. The cold hard truth is the only way you see the sights quickly is if you put them in exactly the right place in front of your eye..every time. The pistol is going to place the bullet where the sights are pointed (provided it’s sighted in correctly) so those sights have to be on whatever it is you intend to shoot..period. This can only be achieved by practice. It doesn’t matter what color or shape or whatever, until you get them in the correct position in front of your eye you aren’t shooting where you want to. As with a lot of things the new stuff almost always seems better at first so we must be very careful not to fall into that trap. Not saying these sights are bad, actually they look pretty good but not earth shattering. Three bars to align is not a new concept, these do it a little coarser than some of the past attempts. The real life saver for those, myself included, that are losing our close vision is the red dot sight. Used correctly you focus on the target and the dot appears as if it is projected onto it, like a laser but not as fiddly. They are getting smaller and smaller and more reliable. Many times when people try a red dot on their pistol I hear the same old thing, ” It takes forever to find the damned dot”, well just like their old iron sights you must develop the skill to consistently place that dot in front of your eye, quickly. I predict that someday we will look back and wonder why we even tried to aim our firearms with primitive steel sights..ok maybe that’s stretching it. At 42, with *ahem* “Older Eyes” I love my aimline sights. I have them on a gen1 Glock 17 and coming up out of the holster and first shot acquisition, I’m very fast with them. They are bold and easy to register. I’ve done some longer range shooting with them, 25 yards at the longest, and while I was only shooting at steel at the longer range, I wasn’t missing. Not very scientific, but I prefer them to my stock M&P sites, and will be putting a set on the M&P as soon as they arrive. What about peep sights? Have you tried those? I would imagine that a rear peep with a sharp tritium front sight should be accurate&fast. 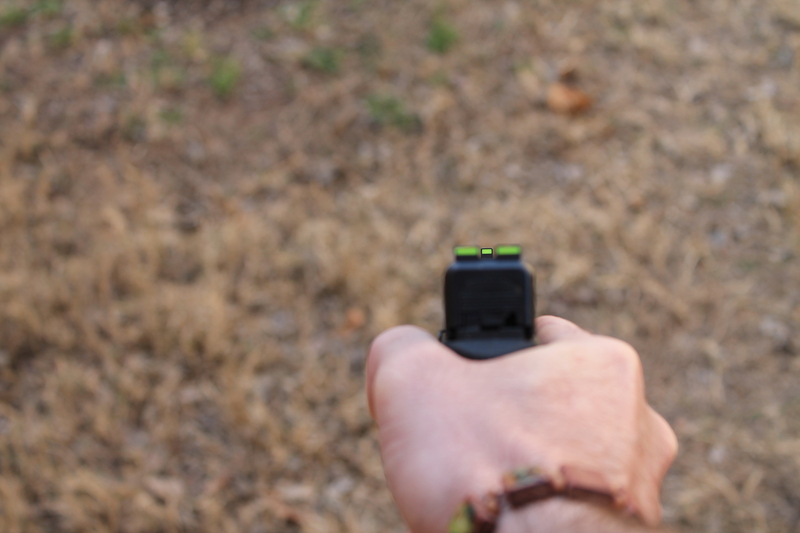 The peep sight concept just doesn’t carry over to pistols very well. To work well the rear sight needs to be very close to the eye using a tiny aperture which you can’t do with pistols, also the short sight radius. Peep sights for pistols have large apertures and are more of a ghost ring type. Ghost ring sights work well on shotguns but you have much more sight radius. I was thinking ghost ring, I just call them peep sights because they are almost the same (basic principle). Just what I was thinking + a tritium front and it would be perfect. I’ve been getting a similar effect for some time now on my guns with black sights, by using Nitesighters. Some of their offerings are glow-in-the-dark greenish white; they also have fluorescent green, red, orange and yellow. I usually apply them in a bar-dot-bar pattern. While I find they help a lot, I’d prefer a sight built from the start to look like these do. Thanks for pointing them out. Blacked out rear and fiber front all the way. With aging eyes I went in search of OG sights, trying several different configurations, all with limited success. I finally resorted to a trip to an optomitrist a friend recomended as “shooter friendly”. After explaining my dilemma he tried several different lens combinations in the store, each having their own set of problems and no ideal solution. He finally suggested contacts. Ignoring my multitude of excuses he popped in a pair, “Hey wait, these aren’t bad”! A few more combinations and success, a solution. Multi focal contacts with each eye having a different job. One does the near work in the center with distance on an outer ring, the other the opposite. It took my brain about 5 minutes to figure it out (he rightfully suggested that I’m slow) and now I can leave the trifocals at home. What started as a search for shooters became a daily lifestyle upgrade. I’m now back to the factory Glock sights and looking for something functional, not just choosing a set because my old eyes can see them. For those with older eyes, Advantage Tactical sight work great I put a set on my Glock 19 and found them much easier to shoot with. In complete darkness, they can be a handful, since you don’t get any clue whether the bright dot you’re looking at is the front or rear sight (I know consciously it is the rear, but still), or if the gun is twisted to one side, whether the front or rear dot is the one to the left or right…… Not a big problem, but hard to make as instinctive as a 3 dot or Big dot. I absolutely love the “target sight” accuracy, though. And that’s with the medium notch; not their recommended, narrower “target” notch. These days, sights are realistically just to get the laser dot within the general area anyway; not? I saw RF’s article on getting monofocus eyeglasses. I had the optometrist give me a prescription for these, as well as my normal scrip for progressive lenses. 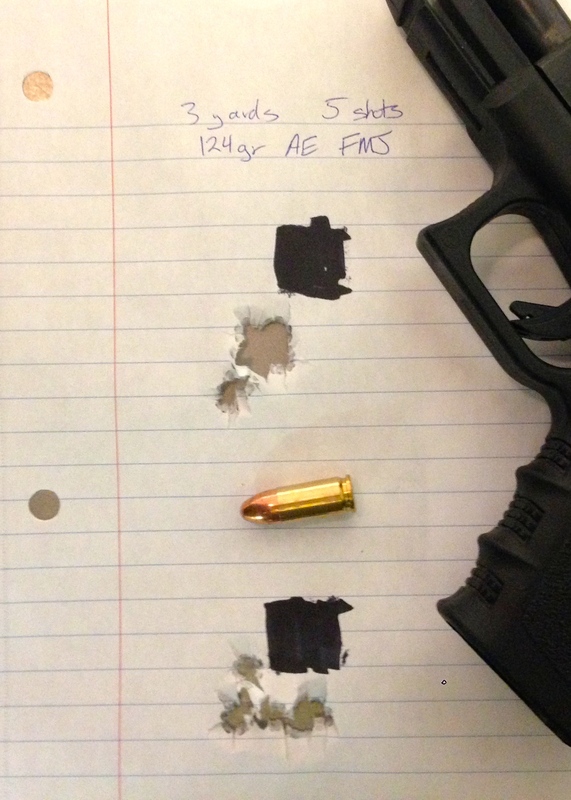 Front sight focus measured out to 27″, which also seems to work well for rifles with the other lens set for distance. It took only a few minutes to adjust, and it’s transformed my pistols shooting dramatically. Didn’t want to deal with contacts, so you should know that eyeglasses work as well. These look like perfect candidates for a Super-Luminova night sight variant. They appear to have enough surface area to really light up. Personally, I’d take that over the tritium. –Someone needs to try it out, anyway.